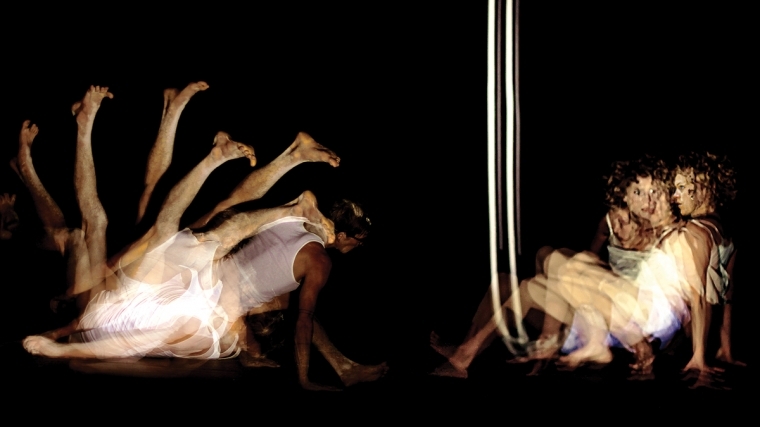 “Circus stripped bare”: Tracey Sinclair reviews The Ricochet Project at Brighton Festival. Smoke and Mirrors at Brighton Dome. Billing itself as ‘circus as you’ve never seen it’, The Ricochet Project’s Smoke and Mirrors is in fact far less showy and more serious than that would suggest, but it is a technically stunning and surprisingly moving piece of physical theatre. Conceived, directed and performed by the impressively agile Cohdi Harrell and Laura Stokes, if it is circus, it is circus stripped bare – a dark stage, minimal props, and the performers themselves gradually peeled to near nakedness. It begins as Harrell and Stokes, dressed for City life, grapple for space and dominance on a trapeze. It’s a striking opener (it drew actual gasps from the audience) as they clamber over one another to a soundtrack of a voice quoting obscenely high amounts of money; they are literally standing on one another’s heads, shoving and pushing one another out of the way, seemingly without realising the system is rigged – no matter who wins, there’s simply nowhere for them to go. Their aerial acrobatics are tightly choreographed and skilfully executed – Stokes’ solo work in particular is mesmerising, as she twists and tumbles in the ropes, struggling against their hold even as they are the only things that keep her aloft. She brings a real sense of danger to the performance, seeming constantly at risk of plummeting to the stage – it must take an incredible amount of skill to look so convincingly out of control. The production is a commentary on capitalism, on America, and though it can at times seem bleak – reinforced by an evocative soundtrack and harsh, occasionally aggressive lighting (audio master Paul Feathericci, technical director Daniel Stote and lighting designer Leti Mar all providing fine support), it ends on a note of cautious optimism. In an eloquent rope ballet played out against Charlie Chaplin’s Great Dictator speech denouncing greed and tyranny and pleading for ‘kindness over cleverness’, the pair are brought together. As they hold and cradle one another, it is this mutual support that allows them to reach out beyond themselves, working in harmony, in contrast to the hardscrabble scuffling of the opening scenes. It’s too complex a piece, however, to give us a pat happy ending. The two of them get dressed together, no longer at opposite ends of the stage, suggesting they have to some extent overcome their separateness, but there’s also a slight sense of defeat in resuming the garb of the daily grind, as if any escape can only ever be temporary. But despite this, it’s hard to imagine anyone leaving this taut, thought provoking production without being both in awe at the physical prowess on display, and at least a little uplifted by its message. Smoke and Mirrors is on until 10th May 2016. Click here for more information.